DENVER, USA -- Santa piled up more than presents this year — trackers at NORAD say he also broke records during his global mission Christmas Eve. Volunteers take phone calls, averaging 8,000 an hour, and answer emails at the Volunteers at Peterson Air Force Base in Colorado fielded just under 100,000 telephone queries about his progress late Saturday, breaking the previous mark of 80,000. And his NORAD Facebook page approached one million "likes," compared with 716,000 a year ago. Volunteers at NORAD Tracks Santa said kids started calling at 4 a.m. Saturday to find out where Santa was. "The phones are ringing like crazy," Lt. Cmdr. Bill Lewis said Saturday. The North American Aerospace Defense Command has been telling anxious children about Santa's whereabouts every year since 1955. That was the year a Colorado Springs newspaper ad invited kids to call Santa on a hotline, but the number had a typo, and dozens of kids wound up talking to the Continental Aerospace Defense Command, NORAD's predecessor. The officers on duty played along and began sharing reports on Santa's progress. It's now a deep-rooted tradition at NORAD, a joint U.S.-Canada command that monitors the North American skies and seas from a control center at Peterson. Officials said records set this year were likely generated by people passing the word as well as social media interest. "I think what happens is that every year the ones the participated" tells others, Canadian Navy Lt. Al Blondin. "There's word of mouth." After visiting many nations, Santa's first stop in the U.S. was in Atlanta. Blondin said. The NORAD website said Santa then set a generally westward course, making numerous stops including Cleveland, Toronto, and Denver. Blondin said he was expected to pass through Hawaii before his traditional last stops in Alaska before heading for home. 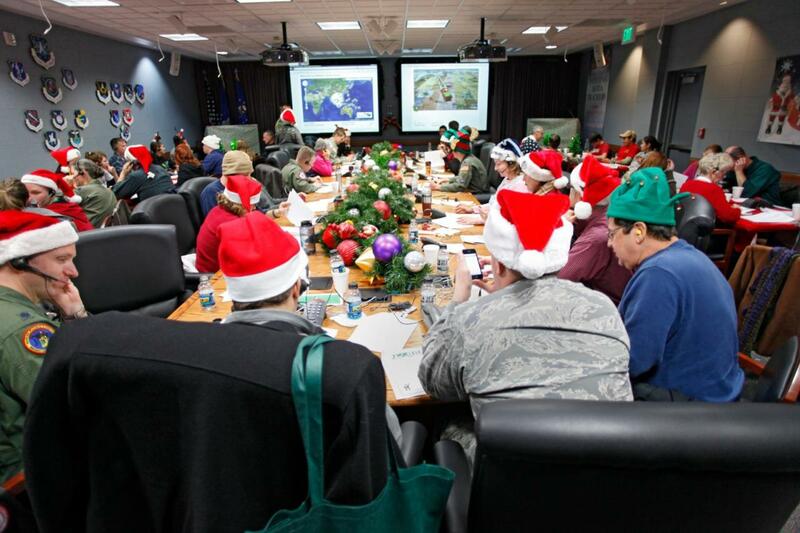 NORAD's Santa updates are blowing up on social media, too. In addition to the website and Facebook and Twitter pages, Santa this year has a new tracking app for smart phones. The app includes the Elf Toss, a game similar to Angry Birds. Blondin said there had been more than 700,000 downloads. First lady Michelle Obama was among the volunteers for a second year in a row. She took about 10 calls from her family's holiday vacation in Hawaii. Lewis said Obama's voice didn't throw any of the phoning children. "They all just asked run-of-the-mill stuff. They wanted to know about Santa," Lewis said.